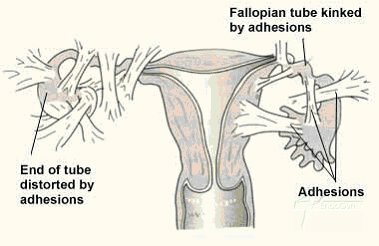 Home › Adhesions › What is an Adhesion? Inside your body your organs freely move around one another; they are slippery and can touch one another without sticking. Sometimes, two different tissues end up sticking together. The place where they are stuck together is called an adhesion. Adhesions can form as a result of trauma, injury, or because of excess inflammation. Sometimes surgical procedures, especially repetitive ones, can create adhesions. Having Endometriosis puts you at a higher risk of developing adhesions. As endometrial implants attach themselves onto the various pelvic organs (fallopian tubes, ovaries, colon, etc) the risk of having adhesions goes up. When adhesions occur in the pelvic area, symptoms can include severe sharp pain in the area of the adhesion, nausea, and general pain or discomfort. Additionally, adhesions on the ovaries or fallopian tubes can cause the organ to fail, increasing the chance of infertility. Sometimes, adhesions can occur after surgery due to accidental trauma or the growth of scar tissueâ€¦ the more surgeries you have, the higher your risk. When Dr. Davis performs his surgeries he checks your entire pelvic area for adhesions using a powerful camera. If any are found, they are immediately removed. To minimize post-operative adhesions, he chooses laparoscopic procedures (which have smaller incisions) whenever possible.